How do I know if my child is ready for a tri? The only qualification that kids need is the ability to ride a bike without training wheels along with a big heart. What does my child need to bring to the tri? Bike, helmet, running shoes and socks, swim gear, racing shirt or race belt, towel and fan club. What time does my child start? The transition area is open from 6:00-7:00 a.m.. The 12-15 year old division will begin the swimming portion at 7:30 a.m. and all other age divisions will follow. What if I have problems with my bike before or during the triathlon? James Brothers bike shop will be providing bike maintenance before and during the race. What if my child is nervous about the swim? Keep in mind that the swim distances are age appropriate. We will also have between 4 and 5 lifeguards at the race. Both Auburn and Opelika have swim teams that children can join as well as swim lessons that are offered through both cities and Health Plus. How does my child prepare for the bike? The best way to prepare for the bike portion is to practice riding skills such as mounting the bike, dismounting, rounding curves. Also designate a relatively flat course that is close to the race distance. Training wheels are not allowed. How does my child prepare for the run portion? The key to running in this race is pacing yourself. This is the hardest part for most kids. Practice running at a comfortable pace. Remind your kids that walking is allowed. Safety is our most important concern. We will have lifeguards at the pool. We will have volunteers staffing the bike and run courses. The Opelika police will close Andrews Road during the triathlon to insure safety. We also have a safety and medical team on site during the event. How will we know our child’s finishing time? All children will wear a tri tag around their ankle which will immediately record their split and finish times. There will be a time trial start with a competitor entering the pool every 10 seconds and racing against the clock. Parents are only allowed in transition during set up. We will have volunteers in the transition area to assist competitors with shoe tying, etc. Transition is something to practice at home before the tri. Remember, no riding on the bike until you exit transition and you must have a bike helmet on during the bike portion. Do kids need to wear a swim cap? Yes. You will receive a swim cap at packet pick up. Swim caps help us identify participants in the water. Do they need to wear their race number? Only during the bike and run portion. They will have body marking done at packet pickup to help identify them during the swim. Shirts must be worn during the bike and run portion. 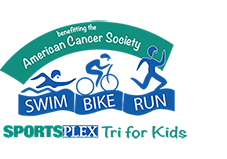 You can pick up on Friday (day before the race) from 3:00-8:00 p.m. at the Sportsplex. Race day pickup is from 6:00-7:00 a.m. PLEASE try (if at all possible) to pick up your child’s packet on Friday instead of Saturday morning. We will have race bibs, swim caps, T-shirts, waivers, and body marking during packet pickup. How should my child train for the Tri? See our training page or heck out transition videos on our facebook page. What do we need to bring the day of the race? Bring your goggles, swim suit, trunks, or tri suit, flip flops, towel, race shirt, helmet, bike, socks, shoes and race belt. What is provided in the packet? ?